Dorothy Porter was born in 1954, and lived in Sydney and the Blue Mountains west of Sydney, before moving to Melbourne. 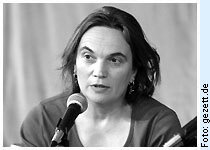 She is the author of eight collections of poetry, Little Hoodlum, Bison, The Night Parrot, Driving too Fast, Crete, Other Worlds and Poems January–August 2004 (2004) und The Bee Hut (2009, Posthumous); and of five verse novels, Akhenaten, The Monkey’s Mask, What a Piece of Work, Wild Surmise and El Dorado (2007). She has also written two libretti and two works of fiction for young adults. She has won the Age Book of the Year for Poetry, the National Book Council Award for Poetry and the 2001 FAW Christopher Brennan Award for Poetry. Her poems are characterised by the short well-spaced line, delivered with great intensity (Porter says that she writes to pop music, and to music with a dramatic intensity). The energy contained in her lines is heightened by their clipped quality. Indeed her poetry has a Dionysiac quality – the urgency and the risk of sexual desire is a frequent subject, but the poems generally have an edginess to them, and deliberately drive to the limits of experience. She has a penchant for exotic settings (ancient Egypt, Crete), film noir (The Monkey’s Mask), and the sublime perspectives offered by such subjects as madness (What a Piece of Work) and astronomy (Wild Surmise). The pagan elements in her work have a characteristic Australian flavour, and also suggest a quarrel with Protestantism and its constraining influence in Australian life. She has had great success with the verse novel, largely because of the intensity and accessibility of her lyrics, and has done more than any other contemporary Australian poet to make poetry interesting to ordinary readers. Porter had been suffering from breast cancer for four years before her death. She died aged 54 on 10 December 2008. South Melbourne: Hyland House, 1994 u.a. More poems of Dorothy Porter in original and further information about the poet.